Liam Traynor is a HUGE hockey fan from Rockland County who happens to suffer from Cerebral Palsy. He joined the guys in-studio to talk about the NHL playoffs and to receive a surprise gift courtesy of the Garden of Dreams foundation. Ryan Ruocco joins the guys in-studio to take a look at how the Nets-Sixers series has transpired thus far and preview tonight's Game 5. Odell Beckham Jr. went on a twitter rant regarding his time in New York after Dave Gettleman's comments. Plus, the Yankees continue to fight through injuries. Mark Teixiera tells the guys why he believes this team can survive the Aaron Judge injury. And speaking of which, what exactly do you blame for all of these injuries?? Aaron Judge is out. Can the Yankees hold down the fort without him? Plus, the latest on Jacob deGrom and Russell Wilson continues to live his double life. The Yankees took two games from the Red Sox and celebrated with a fog machine. Tryin' too hard, bro? Plus, Michael gets upset with Giants G.M. Dave Gettleman. The Lightning suffer an embarrassing playoff exit, while the Islanders advance past the Penguins. Plus, the Yankees get an incredible win behind dominance from James Paxton. Bob Arum joined the Michael Kay Show on 98.7 ESPN to preview Crawford versus Khan set to take place this weekend. Islanders President Lou Lamoriello joined the Michael Kay Show on 98.7 ESPN to discuss their playoff series win over the Penguins. Trey Wingo joined the Michael Kay Show on 98.7 ESPN for his weekly spot and discussed Tiger winning the Masters and Russell Wilson's contract extension with the Seahawks. The Yankees and Red Sox square off for the first time in 2019. Who needs these wins more? Plus, the Mets pick up a win in extras and will the Islanders advance tonight? YES Network analyst David Cone joined the guys to talk about the Yankees injury troubles and how analytics has affected the game of baseball. 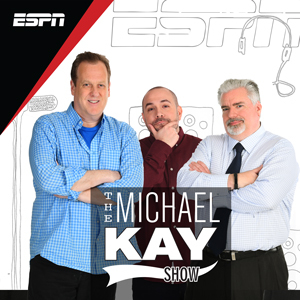 The Michael Kay Show discusses Tiger winning at the Masters. How much of a role did Tiger effect play? Plus, the Yankees continue to struggle & is Jacob deGrom slumping? Tiger's caddie, Joe LaCava joined the Michael Kay Show on 98.7 ESPN to recap the historic win at the Masters. Alex Rodriguez joined the Michael Kay Show on 98.7 ESPN to discuss what has gone wrong for the Yankees early in the season. Plus, the effect of analytics on baseball. Sarah Kustok of the YES Network joined the Michael Kay Show on 98.7 ESPN to provide the keys for both the Nets & Sixers in Game 2. Mike Greenberg joined the Michael Kay Show on 98.7 ESPN to discuss the significance of what happened at Augusta with Tiger Woods winning his first major since 2008. The Yankees were just swept by the Astros. Is it time to be worried? Plus, would it be fraudulent for Devils fans to root for the Islanders in the playoffs? Magic Johnson has walked away from the Lakers. Does he deserve more criticism than he's getting? Plus, sloppy play is catching up with the Yankees and an Islanders preview. Trey Wingo attempts to respond to Don's attack on golf as we prepare for The Masters. Plus, what exactly happened with Magic Johnson and the Lakers?? Rick DiPietro joins the guys to share his thoughts on the Islanders playoff series vs Pittsburgh. Plus, Rick divulges the trash talk he used to throw at Evgeni Malkin. Yankees LF Clint Frazier joins the guys to discuss his road back to baseball, the hot start he's gotten off to and how much fun it is playing for this team. Adrian Wojnarowski joins the guys to discuss Magic Johnson's bizarre resignation from the Lakers. Plus, Woj weighs in on the Durant-Knicks rumors. There was talk of golf. Don La Greca didn't care for it. A rant ensued. The Virginia Cavaliers are national champions. We recap a wild title game. Plus, the Yankees get some troubling news on Luis Severino and the Mets of '86 are back in the news. Mark Teixeira joins the guys to share his thoughts on Luis Severino's problematic injury. Plus, what's going through Chris Davis' mind during this 0/47 slump? College basketball will crown a champion tonight, but is there controversy with how Virginia got here? Plus, Drop Madness also concludes and the Yankees bounce back in BAL. Former WFAN morning show host Craig Carton joins The Michael Kay Show to discuss his dramatic fall from grace as Carton prepares to spend the next three and a half years in prison. The Brooklyn Nets are heading to the playoffs for the first time since the 2014-15 season. Their Head Coach, Kenny Atkinson, joins the guys to discuss the achievement. Seth Greenberg joins the guys to share his thoughts on what was a wild ending between Virginia and Auburn. Plus, as a coach, what would he say to Samir Doughty after committing a foul in a moment like that? On Friday's show, the guys discuss Craig Carton's sentencing and the decision to have him join Monday's program. Plus, are the Yankees injuries a reasonable excuse for their slow start? Upon announcing that he will be stepping down as President of the Rangers, Glen Sather joins the show to reflect on his legendary career. The guys discuss rumors of Kevin Durant being done in Golden State and whether or not the Knicks will be in his future. Triple H of the WWE joins the guys to preview Wrestlemania at MetLife Stadium and to talk about getting into the Hall of Fame with D-Generation X. The injuries are really piling up on the Yankees. Plus, Don goes up and in on Ron Darling for the book he wrote and could the Giants really stick with Eli Manning in 2020? Trey Wingo joins the guys to share his thoughts on Ron Darling's book, Eli Manning's future in New York and the Final 4. John Gibbons was a member of the 1986 Mets and expressed his surprised over the allegations of Lenny Dykstra. He also discussed the code of sharing stories from inside the clubhouse. Darryl Strawberry gave his take on Lenny Dykstra vs. Ron Darling, and it may surprise you. Plus, the 2019 Mets continue to roll and injuries are piling up for the Yankees. Mark Teixeira joins the guys to share his thoughts on the rash of injuries running through the Yankees clubhouse. Plus, why do players get benched when they're in the midst of a hot streak??? Doc Gooden joins the guys to defend Lenny Dykstra against allegations of racist behavior made in Ron Darling's new book. Jay Bilas joins the guys to look back on a thrilling weekend in college basketball and share his thoughts on what went wrong for Duke. After dropping two games out of three against the Orioles, how concerned should Yankees fans be? Plus, Ron Darling made explosive accusations about Lenny Dykstra in his book. The Yankees and Mets both have their first win under their belt and fans are feeling good. What should fans take from the first win of the season? Plus, more Drop Madness! The Yankees and Mets both picked up Opening Day wins. Did Jacob deGrom validate his contract extension? Plus, will Don travel to the trailer at Yankee Stadium this season? The NFL has made some rule changes after a questionable ending to the NFC Championship. Plus, Chris 'Mad Dog' Russo stops by to look ahead to baseball season. Mark Teixeira joins the guys with a 2019 MLB preview. He gives his thoughts on the Yanks being the team to beat, the Mets deciding to pay deGrom and more. NFL rules expert Mike Pereira joins the guys to discuss what he likes and doesn't like about the new rules (NOTE: there's a lot that he does not like). Trey Wingo joins the guys to share his thoughts on the NFL replay changes. Plus, is Peter a fraud for loving Zion? The face of Baseball Tonight on ESPN, Karl Ravech, joins the guys to give some of his predictions for the season and to share his thoughts on the Jacob deGrom contract. Jacob deGrom and the Mets have agreed on an extension. Should the Mets have waited to get this deal done? Plus, Drop Madness rolls on and Michael rants! Noah Syndergaard called out the Mets for having the team travel to Syracuse and not paying Jacob deGrom. Was Syndergaard out of line? Plus, Giants ownership speaks. Yankees owner Hal Steinbrenner joins the guys to discuss the team deciding not to sign Machado or Harper, how they'll go about trying to keep their own guys and more. Michigan State head coach Tom Izzo was caught on camera screaming at a player of his. Was Izzo out of line? Plus, March Madness and Drop Madness roll on! Seth Greenberg joins the guys to share his thoughts Tom Izzo's coaching style. Plus, is there any way Ja Morant could jump up to number 1 in the draft? Will the Giants draft the replacement for Eli Manning this year? Plus, the tournament begins, Drop Madness begins and we hear from a special guest that isn't too fond of Don. Landon Collins joins the show to talk about why he is no longer a Giant, if he was surprised to see Odell Beckham get dealt, if Eli Manning can still play and more. "Inside the Empire: The True Power Behind the New York Yankees" is a fascinating look behind the scenes with the New York Yankees. The authors, Bob Klapisch and Paul Solotaroff, join to tell the stories. MLB started their season in the early hours of the morning. Was it a mistake? Plus, when is it time to panic for Yankee fans about the injuries that continue to pile up? Former Met Art Shamsky joins the guys to promote his new book "After the Miracle: The Lasting Brotherhood of the '69 Mets." Trey Wingo talks with the guys about the decision of whether or not to go with Haskins or Murray at QB. Plus, was the Odell trade really all about moving up for a QB? Mike Trout cashed in for almost half a billion dollars. Is he worth that much money? Plus, the injuries are piling up for the Yankees. Is it time to be concerned? Giants G.M. Dave Gettleman is doubling down on his plan built around Eli Manning. Is that the wrong move? Plus, Zion Williamson continues to shine. RJ Bell joins the guys with his gambling expertise as you prepare to fill out your March Madness brackets. St. John's Head Coach Chris Mullin joins the guys to preview the team's chances vs Bobby Hurley and Arizona State. Seth Greenberg joins the guys to discuss the amazing rise of Zion Williamson and how he felt about the job done by this year's selection committee. Sal Paolantonio joins the guys to share his thoughts on the direction the Giants are going and to explain why he felt they made out great in the Odell deal. Do the Giants deserve as much criticism as they're getting after trading Odell Beckham Jr.? Plus, Zion Williamson dominates in his return and Bryce Harper is injured. Brian Cashman joins the guys to discuss the Luis Severino injury and whether or not the Yankees would consider signing Dallas Keuchel. Odell Beckham Jr. is out and Golden Tate is in at WR for the Giants. Michael and Peter continue to wonder what direction they're headed in. Plus, where is Don? Trey Wingo joins the guys to share his thoughts on what has been a fascinating NFL free agency. Plus, Michael turns the heat up on Trey for missing his spot on Wednesday. Jordan Raanan joins the guys in-studio to try and explain what it is the Giants are trying to do and why they felt the need to send Odell packing. Maniacal Giants fan Dave Rothenberg Show joins the guys to express his disgust over the state of the team. Odell Beckham Jr. has been traded to Cleveland. Do the Giants have a plan? Plus, the Jets land RB Le'Veon Bell. Will the Jets be a playoff team in 2019? Chris Canty joins the guys to discuss the Odell Beckham trade and try to shed some light on what Dave Gettleman has in mind. Russ Salzberg joins the guys to share some interesting insight on the Odell Beckham Jr. trade including John Mara's thoughts on the state of the team. The Jets are heavily involved in free agency, so how did Anthony Barr get away? Plus, will the Jets land Le'Veon Bell, Russell Westbrook has more drama and Don rants! Louis Riddick joins the guys to discuss the Jets free agency moves as well as the Giants questionable approach. Landon Collins intends to sign in Washington. Should the Giants have traded him at the deadline? Plus, James Dolan has an overreaction to a fan at MSG after a Knicks game. The voice of NYCFC, Joe Tolleson, joins the guys to preview their upcoming home opener against Wayne Rooney and DC United. The Giants have traded Olivier Vernon to the Browns in an attempt to repair their offensive line. Plus, Michael continues to earn his Narc-O-Mania nickname. The rumors of Odell Beckham Jr. being traded continue to swirl. Will one of the rumors eventually be true? Plus, sad news regarding former Mets pitcher Tom Seaver. Former Met Art Shamsky joins the show to share his thoughts on Tom Seaver. Upon hearing the unfortunate news that Tom Seaver has been diagnosed with dementia, his former teammate, Ron Swoboda, joined the guys to share his thoughts. Steve Schirripa joins the guys to look back on his time playing the role of Bobby Bacala on The Sopranos and to promote his next gig as host of MSG's Garden of Laughs. Does Kyler Murray deserve to be the No. 1 overall player drafted? One former NFL executive doesn't think so. Plus, Michael tries a new drink that changes his life. In the wake of his report critical of Kyler Murray's performance in the team interview process, Charley Casserly joins the guys to stand by his story. The Giants are letting Landon Collins walk in free agency. Plus, NYY pitcher Luis Severino is shut down for two weeks and Michael contemplates stealing from Stephen A. Smith. Chris Canty joins the guys as we try and and make sense of the Giants decision to let Landon Collins become a free agent. Aaron Judge and Brett Gardner expect the Yanks to break the HR record in 2019. Is that the right approach? Plus, Don hits 120 days without a rant and has his call stepped on. John Tavares returned to a tough crowd out on Long Island. Were Islanders fans too tough on him? Plus, where do the Mets stack up in the N.L. East? Bryce Harper's agent, Scott Boras, joins the show to discuss his client's decision to sign with the Phillies. With Bryce Harper remaining in the NL East, what can the Mets do to try and compete? Buster Olney joins to share his thoughts on and that and more. Bryce Harper is headed to Philadelphia. What does this mean for the Mets? Plus, John Tavares returns to play his former team. Should he be booed? Anita Marks checks in from the scouting combine to discuss the Giants future at QB, what they'll do about Landon Collins and what's being said about Kyler Murray. Trey joins the guys to share his thoughts on the scouting combine including the Giants future at QB. Plus, would the NFL be making a mistake if they don't expand replay? Are the Giants planning to draft a quarterback this year? Will Eli Manning be back? Plus, should the Jets trade back in the first round and a listener calls out Peter. Rick DiPietro joins the guys to discuss the name of his show, his friendship with Michael Kay, John Tavares' return to New York and more. The injuries are starting to hit the Mets. How can they change this pattern? Plus, a spoiled Yankee fan calls in and when will Bryce Harper sign? Stephen A. Smith with the surprise pop in! He joins the guys to discuss LeBron's struggles with the Lakers, whether or not KD will come to New York and when he'll be back on General Hospital. Aaron Hicks and the Yankees have agreed to an extension. Was it the right deal? Plus, Michael goes to Disney World and it all went wrong and does a caller go on too long? We didn't expect to start the show with news that Patriots owner Robert Kraft was caught up in a prostitution sting, but it happened. Plus, Don makes an Ice Pick! Zion Williamson was hurt while playing against UNC, so will he play again for Duke? Plus, an update on the battle for first base in Yankee camp. John Smoltz talks with the guys about the Yankees-Red Sox rivalry, whether or not the Mets could win the East, his conversations about broadcasting with Tony Romo and more. Landon Collins has cleaned out his locker. Is he on his way out? Plus, Don contemplates quitting Ice Picks and should the Yanks have a higher win projection than the Red Sox? Dickie V joins the guys to preview Duke-UNC and share his thoughts on Zion Williamson. Dan LeBatard joins the guys to discuss his upcoming sit down w/ Pat Riley. Plus, will Colin Kaepernick play again? And could Michael, Don and Peter be on Highly Questionable? Trey Wingo joins the guys talking Landon Collins, Antonio Brown, Michael Buble, Sidney Poitier and more! Manny Machado has signed with the Padres. Did the Yankees make the right choice by letting Machado go to San Diego? Plus, what does this mean for Bryce Harper? Jeff Passan joins the guys to discuss Manny Machado's decision to sign with San Diego, what it means for Bryce Harper and what it says about the players' collusion claims. Luis Severino has some advice for Jacob deGrom and his contract negotiations. Plus, is James Dolan really thinking about selling the Knicks? Ian O'Connor joins to discuss the rumors of James Dolan fielding offers to buy the Knicks. Is this a real story? Could Dolan actually be looking to sell? Colin Kaepernick, Eric Reid and the NFL have agreed to a settlement. Plus, Luis Severino and the Yankees nail down an extension. Will Jacob deGrom ever get one from the Mets? Peter joins the guys from Charlotte, NC to share his thoughts on the Kaepernick/Reid settlement with the NFL. If the Mets get off to a slow start, will Mickey Callaway's job status be called into question? Plus, is there any merit to the rumors of the Giants trying to trade OBJ? It's Don's birthday! Plus, Yankees fans aren't happy with the team's off-season, Dave Rothenberg makes an error in choosing his clothes and will OBJ be traded? Buster Olney joins the guys from Tampa to share his outlook on Yankees Spring Training. Plus, will Harper and Machado EVER sign??? Jacob deGrom has made it known that he wants a new deal, but will he get it from the Mets? Plus, should the Giants draft a QB this year and Michael celebrates a special day. Mel Kiper Jr joins the guys to discuss where Kyler Murray and Dwayne Haskins could go in April's draft. Kareem Hunt is back with an NFL team. Was it too soon? Plus, Heisman Trophy winner Kyler Murray commits to football and why car seats are giving people problems. Michael, Don and Peter hit the road to Mohegan Sun in Connecticut to preview baseball season the Yankees and Mets. Plus, are we being too tough on Kevin Durant? Yankees ace Luis Severino joins the guys from Mohegan Sun to discuss his 2018 late-season slump and his preparation for the 2019 season. Red Sox broadcaster and cancer survivor Jerry Remy joins the guys to talk about beating cancer and the rivalry between the Yankees and the Red Sox. Yankees Third Basemen Miguel Andujar joins the guys from Mohegan Sun to discuss his expectations for the 2019 season. The founder of The Connecticut Cancer Foundation, John Ellis, and President of Mohegan Sun, Ray Pineault, join the guys to discuss their work with the charity. Former Yankees' catcher and current YES analyst John Flaherty joins the guys from Mohegan Sun to discuss his expectations for the 2019 Yankees! The NBA trade deadline has come and gone, and Anthony Davis is stuck in New Orleans. Plus, the Knicks make moves and Kevin Durant and LeBron James go on rants. Mark Messier joins the guys in-studio to celebrate 25 years since the Rangers famous Stanley Cup victory. The Knicks are betting on themselves, but will it pay off? Plus, will MLB be making rule changes for the upcoming season and who invented Ice Picks? The Patriots won again. Was this Bill Belichick's best coaching job yet? Plus, were you bored by the Super Bowl and are fans allowed to call in sick the day after the game? The L.A. Rams. The New England Patriots. Who will win the Super Bowl? Plus, continued reaction to the Kristaps Porzingis trade. Super Bowl Champion James Harrison joined the guys to preview Super Bowl LIII. Plus, he gives his thoughts on the dysfunction going on with the Pittsburgh Steelers. Michael, Don and Peter make their final pick of the season! Pregame.com founder RJ Bell previewed the Super Bowl from a gambling perspective and gave some advice on how to make some money on Super Sunday. 2x Super Bowl champion Damien Woody joined the show to discuss why he believes the Patriots will win and also evaluates what went wrong for Peter in the FG challenge. Super Bowl Champion and 98.7's own Chris Canty joined the guys to preview Super Bowl LIII! Kristaps Porzingis is no longer a member of the New York Knicks. Did the Knicks make the right move? Plus, will New York be able to land the free agents they're chasing? When the show began, we thought it would be a big day of previewing Rams-Pats... and then, things happened... Stephen A. Smith weighed in on the shocking Porzingis trade. Wait, wut? Kristaps Porzingis is no longer a Knick??? Alan Hahn joins the guys to share his thoughts on the shocking news. The longest win streak in the nation belongs to the Hofstra Pride! Their coach, Joe Mihalich, joins the guys to talk about the team's great run. NFL commissioner Roger Goodell spoke for the first time since the NFC Championship, Jamal Adams is recruiting some big-time free agents and fish in a microwave angers Don. Anthony Davis wants to join the Lakers, but won't rule out the Knicks...where will he end up? Plus, will we view Tom Brady any differently whether he wins or loses? Anthony Davis wants out of New Orleans, are the Knicks contenders to land him in a trade? Plus, Carmelo Anthony returns to MSG and a caller pushes Don to the brink. Will the Knicks or the Nets be the more popular free agent destination this summer? Plus, can Zion Williamson be a savior and Mike Mussina will not go into the HOF as a NYY. Everyone seems to have anointed Zion Williamson has a franchise savior, but Seth Greenberg isn't necessarily convinced. He joins the guys to share his thoughts. Jeff Van Gundy joins the guys to share his thoughts on the Knicks struggles, the Nets ceiling, Zion Williamson's outlook, James Harden's style of play and more. James Harden put on a show at MSG, but was it as impressive as it sounds? Plus, are the Nets a more attractive free agent destination than the Knicks? RJ Bell joins the guys to start sharing some tips on the best ways to bet the Super Bowl. Mariano Rivera has changed the way the Baseball Hall of Fame goes about their business. Plus, Michael recaps a rocky history with one HOFer & Don has six Ice Picks! Trey Wingo joins the guys to share his thoughts on the PI "non call," Michael's disdain for Mike Mussina, Peter's Duke song and more. Former Yankees Manager Joe Torre joins the guys to share his thoughts on Mariano Rivera getting in to the Hall of Fame unanimously. Reaction to Mariano Rivera being the first player to garner 100 percent of the vote on his way to the Baseball Hall of Fame. Plus, will Mike Mussina enter the HOF as a Yankee? Mike Pereira joins the guys to share his thoughts on what went wrong with the officiating crew on the pass interference non-call and how it can be fixed. The Brooklyn Nets are 17-5 over their last 22 and are now the 6th seed in the East. Their Coach, Kenny Atkinson, joins the guys to discuss their turnaround. For 12 years, Al Leiter has been one of the voices of Yankees baseball on YES... but now, he's decided to step away. Al joins the guys to explain his decision. New Orleans Saints Special Teams Coordinator, Mike Westhoff, joins the guys to share his thoughts on what was a devastating defeat in the NFC Championship game. We knew him waaaaaay back when... and now, Ryan Ruocco is getting married! He joins the guys to discuss the engagement. It's the Patriots and the Rams in the Super Bowl, but do they deserve to be? Plus, should the referees be getting as much blame as they are and the Yankees trade Sonny Gray. Damien Woody joins the guys to discuss the pass interference "non call," Kansas City's awful neutral zone infraction and much much more. The guys get you ready for the AFC and NFC Championship games. Plus, Michael and Don do battle over how Ruth and Mantle would fare in today's MLB. The guys make their official picks for the AFC and NFC championship games. One misstep from Peter this weekend and the Kayster takes home the title. Jason Witten talks with the guys about the upcoming AFC and NFC championship games. He also weighs in on his former team's decision to part ways with Scott Linehan. RJ Bell gives his gambling advice for championship weekend in the NFL.